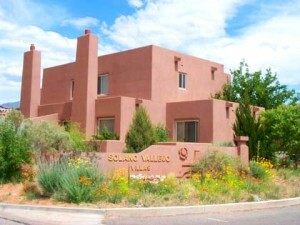 Solano Vallejo Vacation Condo Rentals are located 5 miles south of Moab on the North end of the Golf Course. This development has a seasonal heated outdoor swimming pool which is open April through October. The condominiums have either two bedrooms or three bedrooms. They are two stories, have private patios, and some have elevated patios. 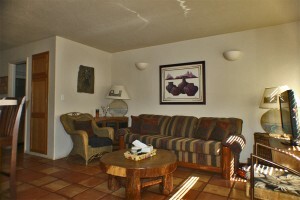 All units have saltilo tile floors and southwestern furnishings. Every condo is fully equipped to make you feel right at home. 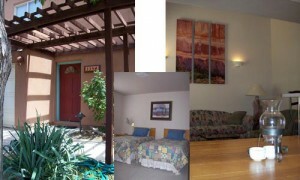 The Thistle Dew vacation rental condo at Solano Vallejo is a 2 bedroom 2 bath home that is equipped for up to 6 people. Master bedroom has a King Size bed, second bedroom has 2 Twins. From the patio you can see the 11th green of the beautiful Moab golf course. After a long day on your favorite trail, kick up your heels at the Happy Trails vacation rental condo. It has 2 bedrooms and 2 bathrooms with a king bed in the master bedroom and two twins in the second bedroom. This condo is a favorite among our loyal guests, so book your dates well in advance. 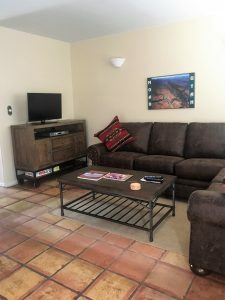 This 3 bedroom 2 bath vacation rental condo has unbeatable views of the Moab Golf Course, the La Sal Mountains, and the Moab Rim. The Master bedroom and second bedrooms have King beds, and the third bedroom has two twin beds.